Listed below are some tips and advice about what exactly the test examiner is expecting from you. It is expected that you make mistakes, after all, you are still a learner. Many learner drivers make mistakes on the driving test. The examiner is expecting this and it is quite normal. What many learners do however, is focus on this mistake thinking all is lost. This puts their mind elsewhere, concentration goes and all is lost. The examiner is looking for general good control of the car, for example not driving on pavements and a good deal of safety, such as not pulling out in front of an oncoming vehicle. If you make a mistake, unless it´s an obvious fail like going through a red light, then chances are it´s just a minor. Let it go and concentrate on the rest of the test. Essentially, the examiner is looking for you to do them safely. If you are required to demonstrate the turn in the road for example and you feel you can´t make it in 3 turns, turn it into a 5 point turn. Or the parallel park manoeuvre, if you feel you may hit the curb whilst reversing, pull forward to correct yourself. Just inform the examiner what you are doing and you may receive a minor in some cases for over-correcting, but providing you do it all safely, there shouldn´t be any problems. This applies to all four manoeuvres. Although it may be tempting to drive very slow, this is in fact dangerous as it can make vehicles behind you impatient and try to over-take. Again, it´s all about safety from the examiners point of view. Generally, keep up with the traffic in front of you unless of course they are speeding. However, as a learner you aren´t going to be as experienced. So when approaching difficult and hazardous systems such as roundabouts, junctions and crossroads, approach them a little slower than everyone else. This will give you a little extra time to look out for other traffic, pedestrians, road markings and traffic lights. It´s better to get 1 or 2 minors for being too hesitant than a serious for being unsafe. Having good all-round observation will give you confidence on the driving test. Many learners when they drive, feel like they are in their ´little bubble´. This is because they are not confident with their surroundings and how they are interacting with it. Having frequent looks in your mirrors will give you the confidence to drive better as you will feel safer and more confident with your surroundings. The examiner is of course expecting you to make frequent checks in your mirrors. Generally speaking, anytime your car changes direction or speed, there should be mirrors involved. Don´t worry if you miss one here and there in your test, they don´t expect perfection, although it´s nice. Just as long as it isn´t frequent and at a particular time when it is essential, then all should be good. The driving test isn´t about your skills as a navigator. If you are unsure where you are supposed to be going at any point, even during the independent part of the test, ask the examiner. They are more than happy to repeat. The amount of times a learner gets to a junction or roundabout for example and panics because they don´t know where they are going. Even if you don´t ask and realize you have taken the wrong turn or exit, it doesn´t matter. Providing you ´get lost´ safely, then that is all the examiner is looking for. Examiner tests you, who tests them ? It´s worth noting and being prepared for an extra and unexpected passenger during your driving test. Like driving instructors, examiners must undergo training and pass certain tests before enrolling as a DSA examiner. Throughout their career, an examiner must also undergo check tests. This is essentially the examiner being tested to ensure they are doing their job correctly. During the driving test, you may find yourself in the car with the examiner in the passenger seat, along with a member of the DSA in the back of the car testing the examiner - and if you have decided to take along your driving instructor, that´s going to be a full car indeed. You don´t get a choice whether you take along the DSA check test individual, but your examiner will inform you of this just before you get into your car. Your examiner will also explain that you should ignore them as they are only interested in testing the examiner and not you. You may well find this extra person in the car off-putting, but try your best to ignore them as they really are not interested in how well or bad you do on your driving test. The chances of this happening on your test is remote as check tests are infrequent, although it´s best to be prepared just in case. Below are some tips and advice whilst taking the driving test. The driving test should be taken in a step by step system. Dealing with each stage at a time. This guide will help you understand the most common mistakes made by learner drivers. Below are tips on how to pass the driving test during the test itself. 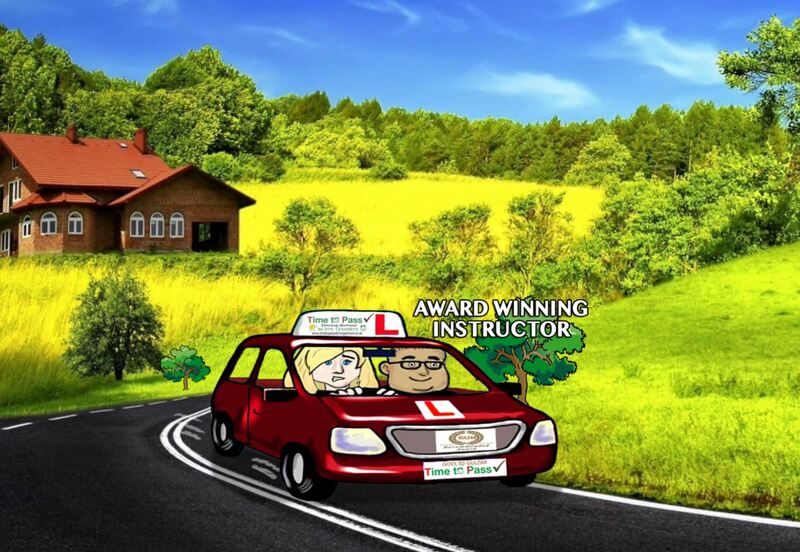 From our experience, a great many learner drivers during the driving test make simple mistakes. Mistakes that usually result in minors. They tend then to dwell on these mistakes thinking all is lost. It is very likely that you will make mistakes during the test. If you do, forget about it and move on with the rest of the test. Keep your concentration on the rest of the test and not what has happened. A common misconception is that manoeuvres need to be completed in a single perfect action. This is simply the case. As in real life, it doesn´t always go to plan, so need readjusting. If you feel you have over-shot a reference point for example, pull forward to correct. Tell the examiner you are going to do this so as they are kept informed of what you are doing. Constant re-adjustment may result in a minor, but it is certainly better than failing the test. Never give up. If the worst happens and you are demonstrating a parallel park for example and hit the curb hard or even mount the the curb, ask the examiner if you can try the manoeuvre again. The is up to the discretion of the examiner, but time permitting they may well allow you another go. Touching the curb gently should be fine. Generally during the driving test, do the speed limit if it is safe to do so. However, you are a learner and have less experience. When approaching potential hazards such as roundabouts, junctions or crossroads, slow down. Approach these a little slower than everyone else. Give yourself the time to select appropriate observations, indication and lanes. Many driving tests are failed simply because the approach speed is too fast and as a result, you are not giving yourself time to see and react with the conditions. Whilst driving on your test, use the appropriate mirrors whilst making turns and lane changes. Check your mirrors frequently whilst driving as this will give you confidence as you will be aware of what is around you at all times. Not sure where to go. If you are in the slightest doubt where to go or didn´t hear the examiner correctly. Ask the examiner to repeat immediately. They are perfectly happy to do so. Even if you realise you have taken a wrong turn and are going the wrong way, don´t panic. You wont fail the driving test for this. The examiner will simply guide you back on course. Similar to above, even though this is the independent part of the driving test, if you forget where to go, ask the examiner. They will tell you. Also, during the independent part of the test, if you take an incorrect turn, it is fine. It is not a test of your ability to navigate, it is a test of your ability to remain competent and safe under stressful conditions whilst relying on road signs to navigate. Not checking the blindspot is a common fail for the driving test. The examiner will ask you to park on the left frequently. Before moving off, ensure you make the appropriate mirror checks and the blindspot to the right. If you need to change lanes at any point, again appropriate mirrors followed by the blindspot of the lane change side.